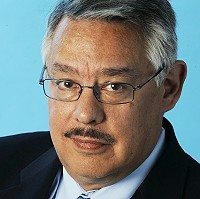 Co-founder and co-host of Democracy Now, Juan Gonzalez has been a professional journalist for more than 30 years and a staff columnist at the New York Daily News since 1987. He is a two-time recipient of the George Polk Award for commentary (1998 and 2010), and the first reporter in New York City to consistently expose the health effects arising from the September 11, 2001 attacks and the cover-up of these hazards by government officials. He is a founder and past president of the National Association of Hispanic Journalists, and a member of NAHJ’s Hall of Fame. During his term as NAHJ president, Gonzalez created the Parity Project, an innovative program that creates partnerships between local communities and media organizations to improve coverage of the Latino community and to recruit and retain more Hispanic journalists. He also spearheaded a successful movement among U.S. journalists to join other citizen groups in opposing the Federal Communications Commission’s deregulation of media ownership restrictions. A founding member of the Young Lords Party in the 1970s and of the National Congress for Puerto Rican Rights in 1980s, Gonzalez has twice been named by Hispanic Business Magazine as one of the country’s most influential Hispanics and has received Lifetime Achievement Awards from the Hispanic Heritage Foundation, the National Council of La Raza, and the National Puerto Rican Coalition. Gonzalez has written four books: Fallout: The Environmental Consequences of the World Trade Center Collapse, documents cover-ups by Environmental Protection Agency and government officials with regard to health hazards at Ground Zero in New York; Harvest of Empire: A History of Latinos in America; and Roll Down Your Window: Stories of a Forgotten America. His latest book, News for All the People: The Epic Story of Race and the American Media, co-authored with Joseph Torres, is a landmark narrative history of American media that puts race at the center of the story.